By now you are probably aware that Sir Bobby has passed away. I did not know him personally but his demeanour, whether engaging the media, playing good football, or during his various spells of top class management, was of the highest order. His heart was never very far from the North East, even when it was geographically in exotic football places, such as Barcelona! It is true that he played for Waterhouses School football team as a youngster. Waterhouses – they were the dreaded enemy! On a serious note he will be missed, not least because of his fine character and his grand example to others of how to conduct oneself on life’s journey. Paul – I think the new site is very good. It is tasteful and easy on the eye. In terms of design, and ease of use, I would give the first site seven out of ten, the second eight out of ten and now this one – ten out of ten. Many congratulations. I have just had a good breakfast of porridge [sprinkled with brown sugar] and a banana. That should keep me going and help to prevent over eating today. Why might I overeat? My family has just lost a member of the extended family in tragic circumstances. Elderly and lovable Peter. He was a very young junior Army officer towards the end of WW2 and very much a ‘giver’ rather than a ‘taker’ in life. He had been terminally ill. Very few people inspire me – Harry Barlow is one, and the Army officer that gave that famous speech to his troops in Iraq is another. Peter is yet another; if I was half the man I would be delighted. He was a wit. He was an educated man despite not having the benefit of formal higher education. I would have given him an honours degree in human decency, and life radiance, if given the power to do so. I have just read bits of the Times. We are told that the electorate will welcome a Tory cut is public spending. One comment by a member of the public said he could trust the Tories far more on cuts. In one sense he is surely right; they are the master cutters – but personally I would not trust George Osborne, the Shadow Chancellor, to deal wisely with the contents of the purse that I found in Durham Road, Ushaw Moor in the 1950s. I celebrate the ‘Memories Section’, and long may it continue, but I cannot help thinking that from time to time each one of us – the metaphorical grey people – real or imagined – should also highlight our ongoing achievements. I do not mean take the opportunity to boast, rather to announce the achievement of little things. Take Alf, he could record that he had learnt to cook a particular dish or remember the words of a certain song if he aint no cook! Any thoughts? 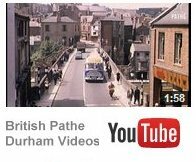 I sometimes worry that perhaps 15% of my postings are not in fact Ushaw Moor memories at all – and that although some readers might think that type of contribution interesting, others might find it tedious. Have you a view? I can take it on the chin. I am sitting here on this Summer Saturday afternoon with the rain and the wind battering the windows. It is more like December. The other day whilst clearing out a drawer I came across a school football medal. It was rather dirty so I cleaned it up and found that the medal was hallmarked silver. Inscibed on the rear are the letters N C W 1953. (Deerness Nursing Cup Winners 1953.) I can still remember vividly the Saturday morning we won and retained the Cup by beating Waterhouses Secondary Modern School. We had beaten the same team the previous season to win the Cup. Large crowds used to turn out to watch these Cup Finals between the schools and the crowd that morning must have numbered 200/300. The match was played at Ushaw Moor. Gordon Gillon and I used to look after the school footballs. They were leather and after inserting the bladder into the ball it then had to be blown up and the neck of the bladder tightly fastened with string and then pushed inside the leather case and then the ball had to be laced up. Quite a feat. The ball was then dubbined to make it waterproof. They were very heavy when dry and if you headed a fast moving ball when it was wet you could see stars. I first played for St. Josephs when I was about 10/11 years old. The first game was at Cornsay Colliery on a Saturday morning. We caught a bus to Esh Winning and then a bus to Cornsay from outside the Co-op. The school at Cornsay was situated half way up the bank on the left hand side of the road going towards Lanchester. We changed in the school and then walked back down the bank and over the beck and turned right at the bottom of the bank on the Tow Law road. We won that day and I played at outside right and scored a goal. If the ball went out of play on one side of the pitch it rolled down an embankent and into the beck. I was given a shiling (5P) for my efforts by my eldest brother Jim. I was flush that day. I can also remember a few years later travelling to Cornsay to watch Cornsay play Sunderland Reserves. The ball ended up in the beck a few times during that match. The Durham Amateur Football Trust has announced that this weekend’s Youth Football Festival has been postponed due to the surface water on the Crook Town football pitch and the continuing rainfall. The Trust hopes to rearrange the event in early August. Trust members have worked very hard to pull this event together and are very disappointed to have to postpone at short notice – but hope that members will understand. Who said the lead singer of Coldpay can’t sing? Oh yes he can. Back in the 50s we had a supervised game of football in the playground. Mr Spence was the teacher on duty.I captained one side [the reds] against the blues. It is a remarkable that I played at centre forward and missed about twenty chances. I was not a natural striker and every time the keeper came out, to narrow the angle, I shot wildly; I imagine the windows of St Luke’s Church must have been in danger, especially when I had been forced out to the left, at the Esh end, prior to shooting. Never again did I allow such panic to occur; it was just a wild tune up. Anyway the glass was half full, was it not ? At least I had engineered twenty chances. Also back in the 50s I found it very painful indeed to have a different surname to my half sister. Sometimes fellow pupils would ask me why I had a different surname. It really was distressing; it was as if I was the victim of the cold and unimaginative morality of the time, ie one in which divorce, or being born out of wedlock, was more than frowned upon. Good grief -such a situation is common now. When I was about seven I set fire to my half sister’s toy house. Was it an accident? Was it deliberate? What was going on in that tiny brain of mine? Actually I have no idea and had forgotten the incident, until reminded of it many years later! Sometimes I must seem to be like a rebel without a cause. Several times on this site I have stated that it is best not to be overawed by ‘betters’ or the ‘authorities’. Yes do keep within the law – but at the same time if you feel something is wrong I think it is usually best to say so. Life is very short but youngsters are often slow to realise it, and by the time they do it might be too late. It is amazing what confidence can do for you. I say to youngsters get a bit of an education – it does not need to be a degree – get experience and fix some goals. Goals can be changed, or in my case missed. If they are missed do make sure that your local church windows are insured. Now for a bit of further editing: I was not born out of wedlock! That is the case, but I am making myself laugh in the process of typing it!